San Francisco Valley OG Kush is an indica-dominant strain bred from a cross between an SFV OG clone X Afghani (f) and selecting for the best traits over many generations of cultivation. 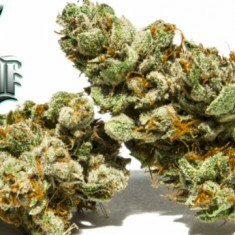 SFV OG Kush is 90% indica/10% sativa hybrid strain which bare similarities in its odor and taste to that of its parent. This bud has an inviting skunky citrus smell with a subtle note of earthy spine. Its taste is a mixture of lemon, spice, and pungent earth which intensifies upon exhale. It is highly recommended to use a vaporizer to get the maximum flavor from SFV OG Kush. It has small lumpy dark-green nugs with sparsely distributed orange hairs, and an extremely rich and sticky resin coating. SFV OG Kush is common among users who love to feel the extremely calming effects typical of indica-dominant strains. It starts with a slight euphoric and uplifted feeling that is accompanied by some lightheadedness, with a tendency to become spacey occasionally. It delivers a body buzz that emanates from the lower part of the spine, and which spreads throughout the rest of the body. It leaves the body completely relaxed, and finally eases into long hours of deep sleep. THC levels of SFV OG Kush range from 19% to 25% in the average. This makes it a perfect strain for the treatment of Chronic Pain, Insomnia, Anxiety Disorders, Stress, Migraines, and Inflammation. This strain drastically increases the appetite so it is ideal for patients with conditions that make ingesting food a bit of a challenge. It is also helps in the treatment of Mild Depression, Bipolar Disorder, and Post-traumatic Stress Disorder (PTSD). San Fernando Valley OG is really good for chronic pain. Helped me out a ton. San Fernando Valley OG Kush is my favorite strain. Thank you for good delivery!